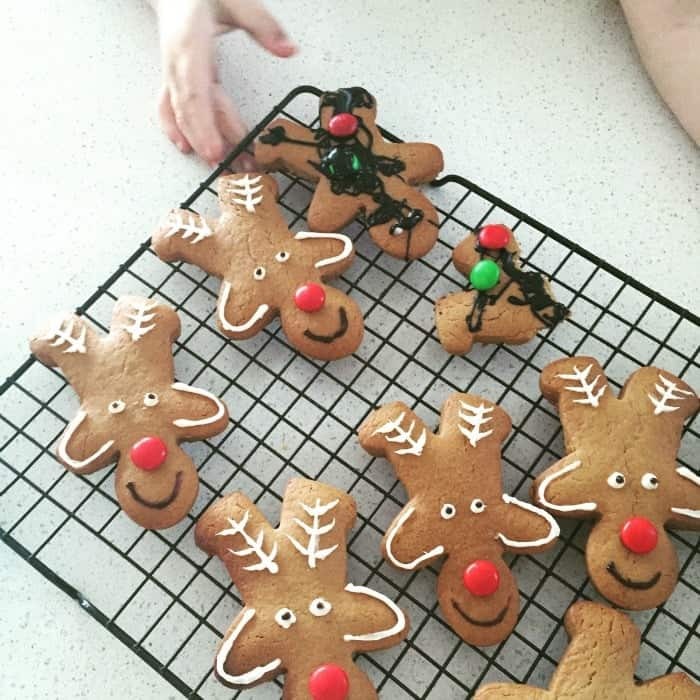 I’m sure that I’m not the only one who has spots those cute creations on Pinterest and vows to make them but either never does or it turns out nothing like the picture – however this is not the case with these Christmas Reindeer Biscuits! 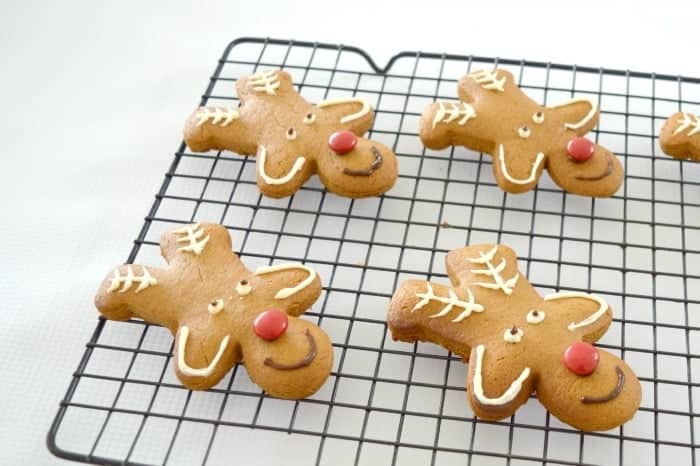 I’ve been meaning to make these Reindeer Biscuits for years, but I always put them into the too hard basket – and after making these I have no idea why! 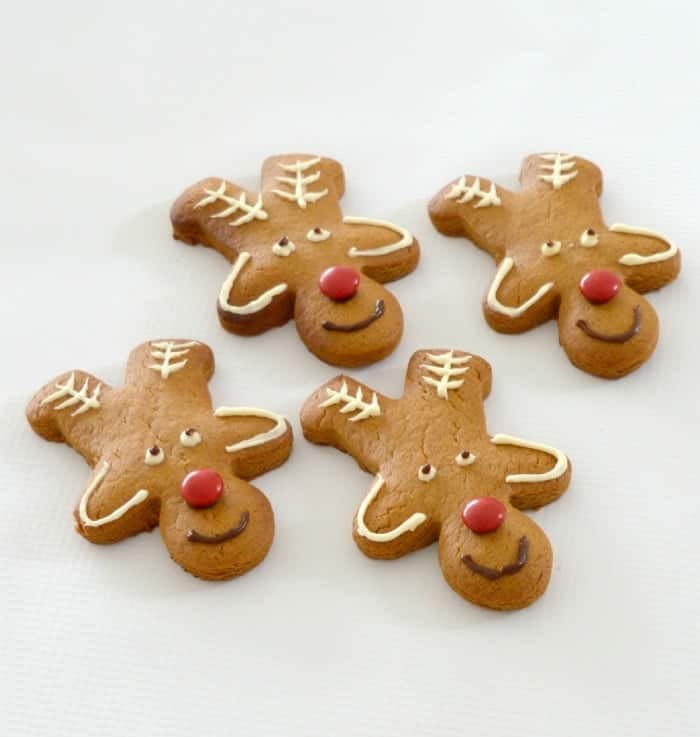 These Gingerbread Reindeers are SO easy to make. 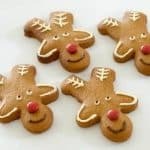 They have just the right amount of ginger so that they are not too overpowering and as well as tasting great, decorating them with the kids is loads of fun! I picked up a chocolate and white chocolate writing icing pen from our local supermarket to add the details to our Reindeers, I find it soooo much easier to use these to decorate vs a piping bag. Then all you need is some red smarties and you are ready to decorate! 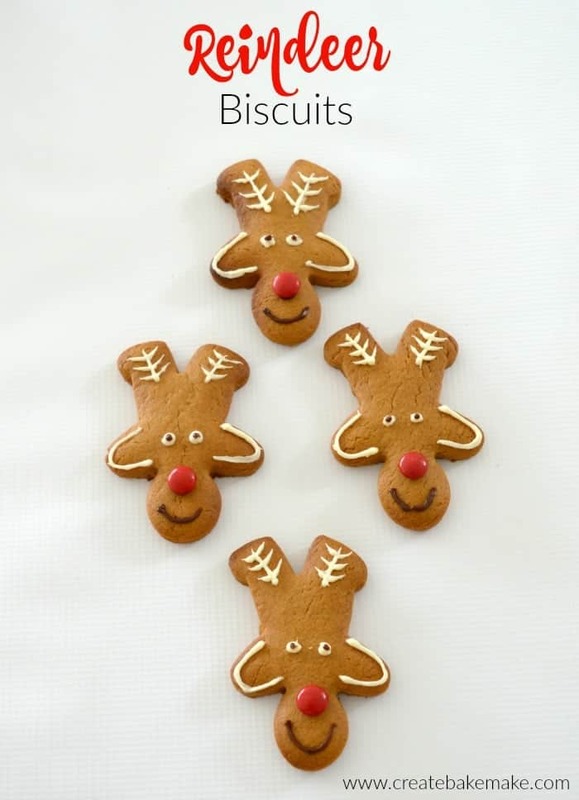 These Christmas Reindeer Biscuits are perfect to take along when you are asked to bring a plate and they would also make a great gift for teachers, family and friends. Preheat your oven to 180 degrees and line two baking trays with paper. In a small heatproof bow, combine the golden syrup, sugar and spices and place over a saucepan of boiling water. When the sugar has dissolved, stir through the bicarb soda and remove from the heat when the mixture begins to bubble. Transfer to a large bowl and stir through the chopped butter. Add the egg and 1 cup of sifted flour and combine. Add the remaining flour and mix together with a butter knife until a dough forms. Turn the dough onto a floured bench and lightly knead until it’s smooth and soft. Divide into two halves and cover with cling wrap before popping into the fridge for 30 minutes. Remove dough from the fridge and roll each portion between two sheets of baking paper until approximately 5mm thick. Use cutters of your choice to cut out shapes and place on baking trays. Bake for approximately 9 - 11 minutes - please note baking times will vary depending on the size of the cutter used. Allow the gingerbread to completely cool before turning upside down and decorating as pictured with a chocolate and white chocolate icing pen. Place a little icing in the centre of your reindeers 'face' to help secure it's nose. Repeat until you have decorated all of your reindeers. Place the golden syrup, sugar, butter and spices into your Thermomix bowl and cook for 5 minutes at 50 degrees on speed 2. Add the egg and mix for 3 seconds on speed 3. Add the flour and bicarbonate of soda and mix for 10 seconds on speed 5 or until combined. Knead for 2 minutes before turning the dough out onto your Thermomat and lightly knead to form a ball. Flatten the dough into a disc, cover with cling wrap and place in the fridge for 30 minutes. Remove dough from the fridge and roll each portion between two sheets of baking paper until approximately 5mm thick. Use cutters of your choice to cut out shapes and place on baking trays. Bake for approximately 9 – 11 minutes – please note baking times will vary depending on the size of the cutter used. Allow the gingerbread to completely cool before turning upside down and decorating as pictured with a chocolate and white chocolate icing pen. Place a little icing in the centre of your reindeers ‘face’ to help secure it’s nose. Repeat until you have decorated all of your reindeers. What a brilliant idea to make such cookies! They look super cute! Thanks Medjea, they are so easy to make and almost too cute to eat! Seriously the CUTEST things ever!!! These are so cute! I’ll have to put these on my girls cooking list for Christmas. Your girls will love them! I had no idea you could get icing pens from the supermarket? They will be going in my trolley in the next shop! They are a game changer, your girls will love them! I love these, hoping to find the time to make them for the kids at school this year. These are adorable!! 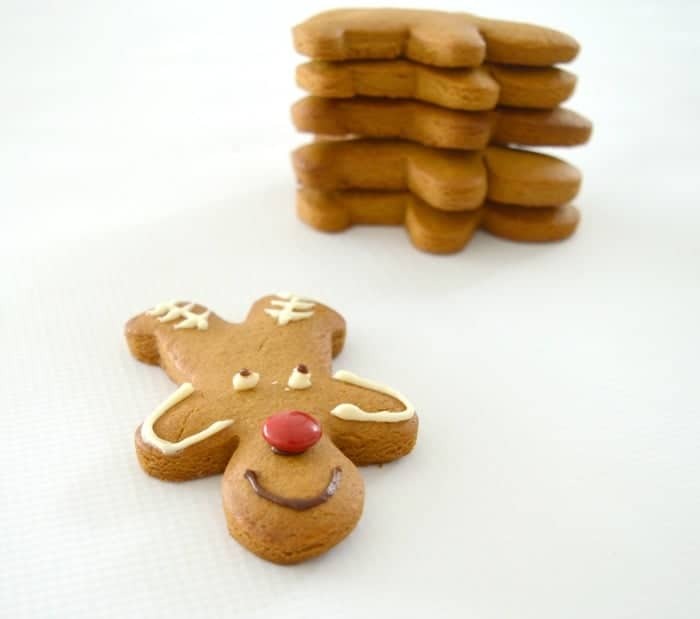 What a great way to kill 2 birds with one stone…gingerbread men & reindeer! Hi. These cookies look amazing but I have a little one who is allergic to egg. Do you have any suggestions for an egg substitute that I could use in this recipe? Hi. We would love to make these cookies but I have a little one who is allergic to egg. Do you have an egg substitute that you would recommend for this recipe? Thanks for the recipe! I wondered if you could make the recipe up until the dough and keep it over night or freeze it for later? Can I use honey instead of golden syrup? I haven’t tried this recipe with honey before I’m afraid. It should still be ok though.